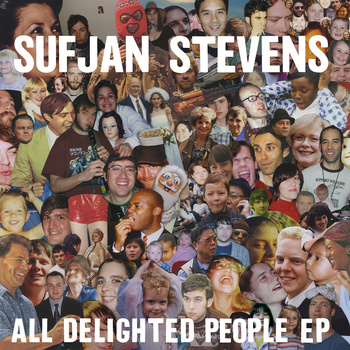 At this point, even Sufjan Stevens seems to have moved on from All Delighted People, the surprise “EP” (at an hour, it’s longer than most people’s albums) he released on Bandcamp on Aug. 20. In the three weeks since, he’s announced a new album, The Age of Adz, his “official” follow-up to 2005’s Illinois, and dropped a pair of beat-blemished singles. So where does that leave All Delighted People, a luxurious collection of orchestral folk that, for all musical intents and purposes, picks up not far from where Illinois left off? On All Delighted People, he finds inspiration, oddly enough, in Simon and Garfunkel’s “The Sounds of Silence,” to which the EP’s title track (which, in two different renditions, covers nearly 20 minutes of the set’s 60 minute runtime) pays homage through lyrical and melodic hat-tips. Without losing Illinois‘ chamber-pop bombast, the song is less Glee and more folk-rock emotive — though unlike Simon and Garfunkel, Stevens seems unconcerned with brevity. The song’s twists and turns are gripping enough, but its length is ultimately inessential — the extended form fails to offer the sort of revelations of, to go right to the top, “Bohemian Rhapsody” or “Stairway to Heaven.” The other tracks are mostly of more manageable, traditional lengths, with arrangements to match — they’re best compared to his Seven Swans material, full of religious imagery, delicately arranged folk and earnest delivery. Closer “Djohariah” begins as a Serge Gainsbourg homage and, over the course of its 17 minutes, builds with a dynamic confidence “All Delighted People” fails to match. Despite its minor failings, on All Delighted People, Stevens remains an able vocalist, a clever arranger, a charismatic performer and a sensitive writer (if not, as the Age of Adz songs are unfortunately revealing, a top-shelf beat-maker). At $5, the EP should be an automatic addition to one’s library. But like Lost, the EP raises more questions than it, or its maker, can answer. By including a second version of the title track, he continues with his fascination with repetition (Illinois outtakes album The Avalanche included three versions of “Chicago”), an indulgence he must surely realize and one that makes the set feel less serious — less a piece of art than a cobbled-together collection, as The Avalanche was. Cut it, add another song or two for balance, and All Delighted People becomes a proper, impressive album, rather than a Mutations-esque one-off or mere fan catnip. Is this a crisis of artistic identity? Of desire? Of legacy? Or perhaps one of fear? After reaching his greatest levels of commercial success, Stevens has spent the last half-decade burying himself in ephemera — The Avalanche, the Christmas box set, the audio-visual left turn of The BQE, and now, this EP — rather than release a conventional, expected follow-up. There’s value in all of this work, of course, but should Adz arrive as a disappointment, one can’t help but wonder if Stevens would be better served by spending less time struggling to escape the box and more in remembering that sometimes, thinking inside it works just fine.